BOCA RATON – A healthy Hunter Snyder will key a ferocious FAU pass rush on Saturday at Middle Tennessee – at least that’s what the Owls hope. 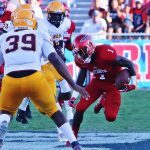 Hampered by an undisclosed injury since training camp, Snyder, a redshirt senior, has yet to start a game this season for the Owls, and missed the Bethune-Cookman victory completely. 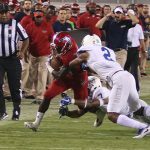 “This has been the most he’s done through a week and hopefully this is the week that we see what I think, when he’s healthy, will be a dominant player in this conference,” FAU coach Lane Kiffin said. A Snyder-less FAU defensive line has been anything but dominant. Through four games, the Owls’ front four managed only three sacks – two by Ernest Bagner and one by Tim Bonner. Working with the first team this week, Snyder would replace Bagner in the starting lineup, bringing 12.5 career sacks with him. FAU expected its defensive line, which rotates as many as 10 players, to be a strength this season. While the defensive line did dominate an FAU offensive line that was still attempting to blend three new starters during fall camp, it has struggled to pressure opposing quarterbacks. Two of the tough defensive line performances came against the best offenses the Owls will face this season. Then-No. 7 Oklahoma, FAU’s season-opening opponent, and then-No. 16 UCF, which FAU lost to on Friday, sport two of the most prolific offenses in the nation. Facing two SEC opponents in its first three games, Middle Tennessee (1-2) showed it can move the ball, averaging 355.3 yards per game behind 6-foot quarterback Brent Stockstill – often doing so with quick drops and short passes. 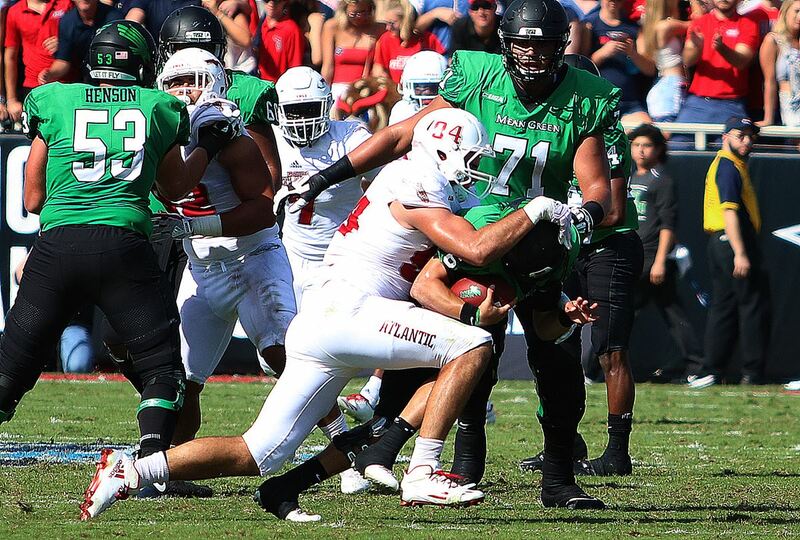 This week FAU’s defensive linemen will have to quickly ascertain whether they should go full bore at Stockstill or attempt to use their height – Snyder stands 6-foot-7, with no FAU defensive end listed as being shorter than 6-foot-3 – to disrupt passing lanes. “You’ve just got to make your money when they do drop back and we have time to get there,” Snyder said. During Thursday’s FAU coach’s radio show on ESPN West Palm, defensive line coach Eric Mathis called the defensive line’s performance during this week’s practices the best it had been all year.